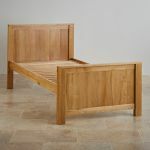 The Oakdale Natural Solid Oak Single Bed is the ideal solution for those looking for a high quality and stylish bed for a child, teenager or even a guest room. 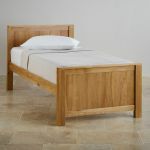 This simple yet attractive design adopts a minimalist approach and has confidence in the quality of the natural oak to be the distinguishing feature of this incredible piece of furniture. 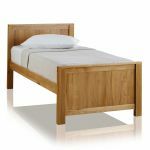 Even the slats are made from 100% solid oak as we refuse to use inferior materials anywhere in our products; every inch is handcrafted using A-grade solid oak so you will never find any chipboard, MDF or veneers. 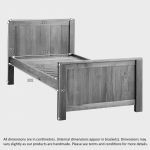 Be sure to check out the rest of the Oakdale range for matching bedroom furniture and a wide selection of mattresses so that you can create a matching bedroom suite.